These are perfectly square, 100% wooden cubes. 100 of them to a pack! A great little gift for any board game fanatic! 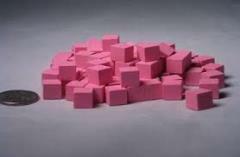 These cubes are pink in color.